provides clinically validated and effective quantities of these critical nutrients in every dose. 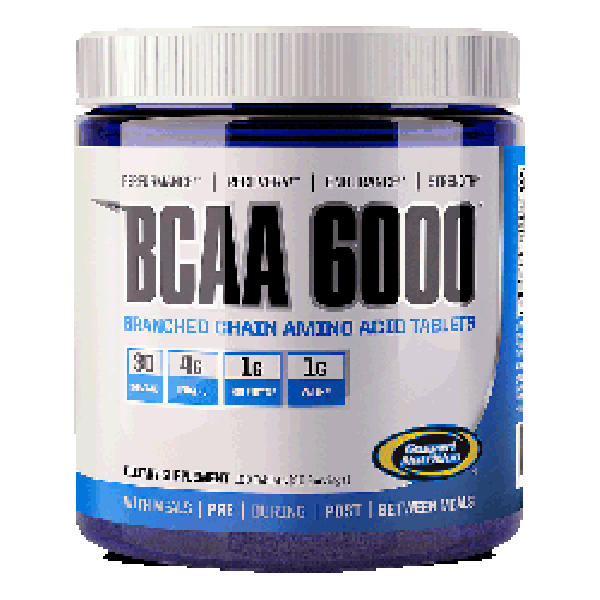 BCAA 6000 from Gaspari Nutrition uses a “leucine heavy”, 4:1:1 ratio of 100% pure pharmaceutical grade branched chain amino acids in a formula that provides clinically validated and effective quantities of these critical nutrients in every dose. The branched chain amino acids (BCAA’s) got their names due to their unique molecular structure that are different from the other amino acids. All BCAA’s are considered “essential amino acids” because your body can’t synthesize them from other compounds and they must be obtained through your diet. Bodybuilders and other high level, advanced athletes have known for years that the BCAA’s are responsible for helping to increase protein synthesis which can lead to faster recovery time, increased lean muscle mass and increased performance and endurance all around. The addition of advanced, highly bio-available forms of Vitamin B-6 and Vitamin B-12 to the BCAA 6000 complex will also help to enhance your energy levels and endurance helping to further maximize your training while simultaneously enhancing recovery. Athlete's Choice: Mark Alvisi, Team Gaspari IFBB Pro "BCAA 6000 is a great way to help stay anabolic in between meals when you're on the go!" Athlete's Tip Some users prefer taking a dose of BCAA 6000 before bed to help fight catabolism along with a whole food meal. Give it a shot and see how much it will enhance your recovery. Been using this product for over a year, I love the pump and recovery I get while using it. 5 star product! !